I'm sure many of you are looking for a status report on 3DMark 11's release. Well, the FM crew has sorted out the major issues causing the delay and 3DMark 11 has gone gold. Futuremark apologizes for any inconvenience the delay may have caused you and can now confirm that 3DMark 11 will be available on Tuesday, December 7th at 14:00 UTC (16:00 EET). It's going to be an awesome launch...and I can't wait to see everyone's scores! " Some of our distinguished members have some nice GFX cards, would you guys mind to share your results with the rest of AOA community? Thank you !!! Last edited by chrisbard; 7th December, 2010 at 04:17 PM. First Bench for 3DMark 11 at MAX Clocks! Anyways this benchmark is super demanding on your system & card(s). I was looking at 15-22 FPS most of the time with this new card! The best I could do was P4535 running at max clock speeds! Now I'm curious as to what others here will score on this bench. Last edited by MUff1N; 9th December, 2010 at 02:53 PM. Wohooo nice result there! I wonder how would your card score if you had a Quad. Let's keep the results coming ! Thanks Muffin ! 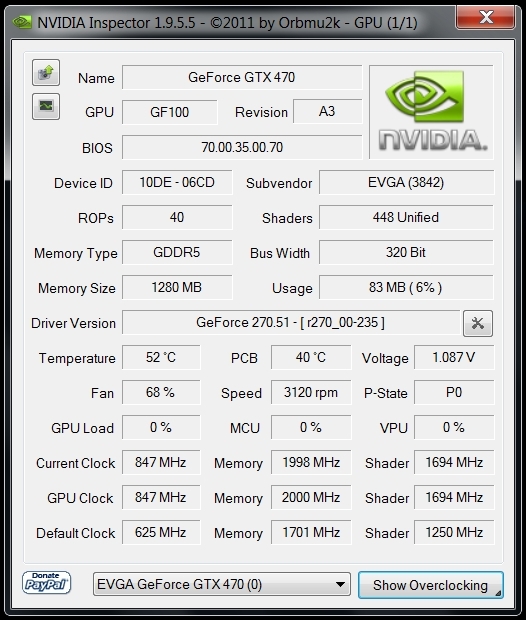 I did a quick test run yesterday, didn't take a screenshot, but I scored 5212 on a QX9650@4G + GTX470@835/1670/1674. I'm sure I can get a bit more, but I need time to get the BIOS settings settled to run 4.35G as I did for my best Vantage run. I already know the GPU is maxxed out at 835 core. Last edited by Necorum; 10th December, 2010 at 06:22 AM. Cheers guys, waiting for some pics and more results! Still have some headroom on the FSB and multi... will play some more when I have time. I was curious as to how these drivers for the 580 would perform on the 470 so I modified the NV_DISP to allow for the installation & ran a few 3DMark tests. 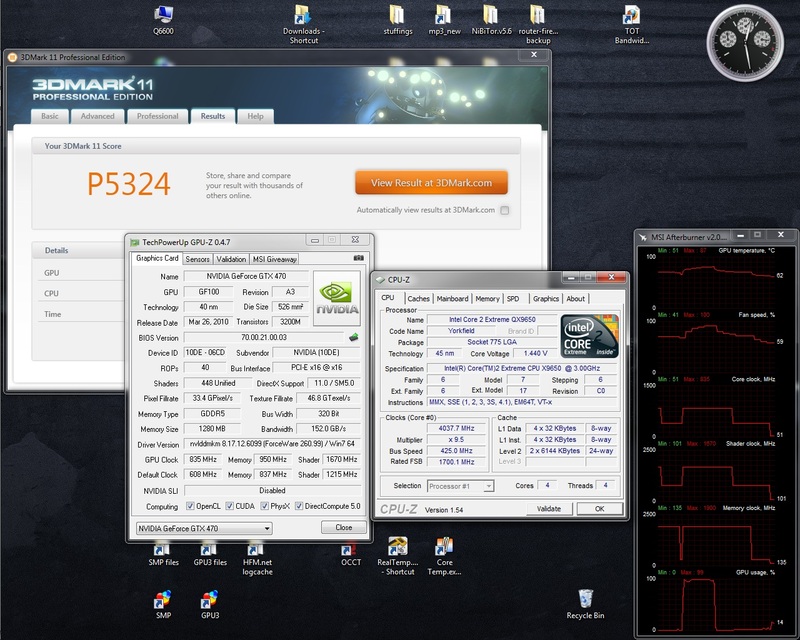 In 3DMark 11 the score went slightly down from 4535 for the DX11 bench to 4526, but for the DX10 Vantage bench it went up! Since I have mostly DX9/10 games I'm going to leave the Geforce v263.09 drivers installed. Last edited by MUff1N; 12th December, 2010 at 07:57 PM. Higher Clocks still & higher score to go with it! I've yet to increase the core voltage with 825MHz being the limit before getting artifacts! Lucked out on getting this one I think as a 32% OC is very good for default core voltage! New 11 score is now P4602! Last edited by MUff1N; 19th December, 2010 at 06:06 PM. Last edited by Necorum; 9th January, 2011 at 06:23 AM. I gave them a try & benched the 266.44 drivers with both Vantage & 11. In both my score dropped. So for my setup the XG 260.99 drivers are working the best thus far. Thanks Nec for the heads up though on the 266.44 drivers. They might have been a good performance boost, but unfortunately not on my system & card. Scores for both below in the screenshots. The XG 260.99 driver scores are in my sig. Last edited by MUff1N; 9th January, 2011 at 05:32 PM. Yea those drivers are mostly for 3dmark 11 and sli systems since the WHQL drivers and XG 260.99 / 263.99 do not enable sli for the bench. 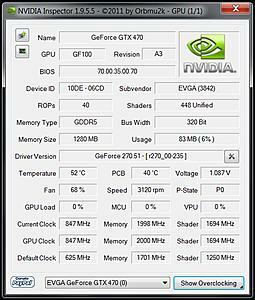 As the title of this post says I used the newest released Xtreme-G Nvidia drivers v266.58 with a 35% OC on the card. Btw, for those that don't already know Futuremark has released an update to 3DMark 11 to v1.01. Has a new UI that shows more info on the bench. Last edited by MUff1N; 20th January, 2011 at 03:48 PM. I bested my last 3DMark 11 bench some so I thought I'd post the results. Last edited by MUff1N; 25th April, 2011 at 09:04 PM.